Mariana Bush, CFA, heads the closed-end fund (CEF) and exchange-traded tracking product (ETP) research group at Wells Fargo Advisors, providing Financial Advisors and their clients with individual security recommendations in the CEF and ETP universes. Mariana began her career at Furman Selz in New York as an associate analyst following technology companies long before the Internet became a household name. 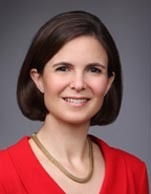 She joined Wachovia Securities (a predecessor company of Wells Fargo Advisors) in 1991 as an analyst in Investment Strategy. Mariana began following CEFs in 1993, and she assumed coverage of ETPs in the late 1990s. She is a Chartered Financial Analyst (CFA) charterholder. Mariana has been widely quoted in publications such as Barron's, BusinessWeek, Forbes, TheStreet.com and The Wall Street Journal. She was graduated from Princeton University in Engineering and Management Systems, a program in the Civil Engineering & Operations Research department.